I said I would be experimenting with the Cherry Bounce in a cocktail. And it came out great. It is quite simple to make if you have some of my Cherry Bounce. What? You don’t have any? Sorry ’bout that. The cocktail is named after my father and his “famous” Cherry Bounce. He liked to drink Old Fashioneds, so the MB Cherry Bounce Cocktail is based on an Old Fashioned, which, BTW, is the “hot” retro cocktail right now. Mine is a bit different. The cherry flavor comes through and goes well with the rye whiskey. I may do some fine tuning, but I think I have a winner. 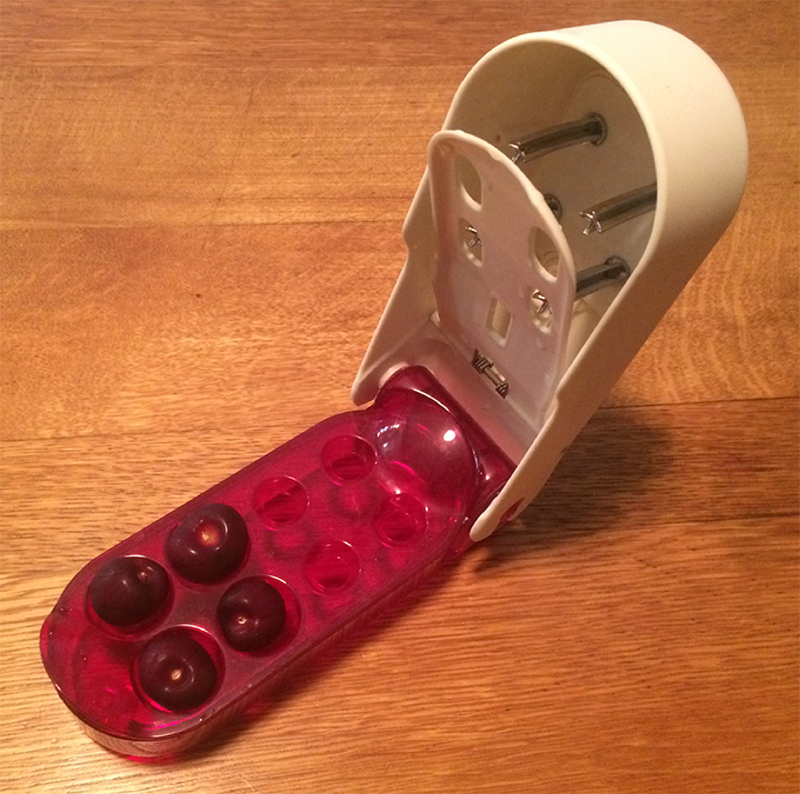 Some months ago I began an experiment making Cherry Bounce. This was driven by the memory of my father telling stories of making Cherry Bounce when he was a kid. He continued to make it later when I was a child. I don’t recall ever tasting MB’s recipe and, unfortunately, I do not have it to duplicate. So, I was driven to the internet to find something I could use as a guide to making my own. 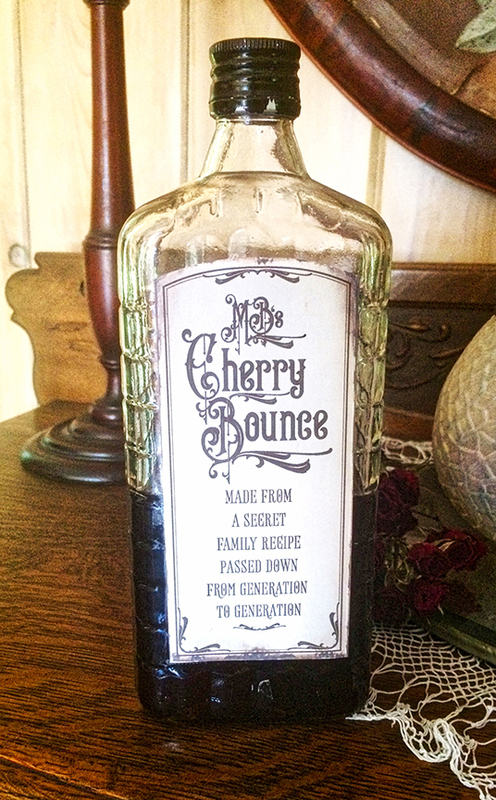 What I found were many different recipes for making Cherry Bounce, some variations of which I used in two previous tests batches. Both came out good and were quite drinkable, but I was just not sure I had achieved “cherry nirvana” yet. My two previous attempts were quite similar. 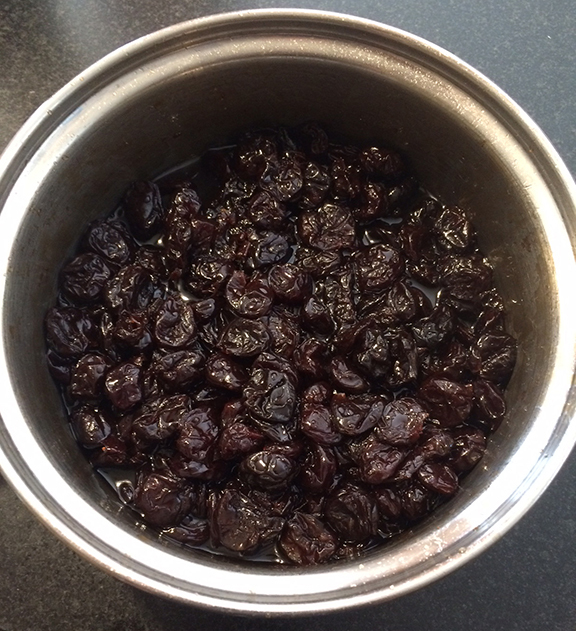 Both used dried tart cherries (which my wife scoffed at, but that was all I had to work with). One was cooked with Sazerac Rye Whiskey added after, and the other was not cooked and had vodka for the alcohol. After several months stored away “aging” in mason jars, I tasted the two samples. Both were good, but the rye version was much more complex, and the clear winner, in my opinion. Fresh Bing cherries are now available in the stores, so I decided to try another test with fresh cherries. Most of the “old” recipes called for fresh, tart, wild cherries, and sweet Bings would be a departure—but they were available. We began a third test batch today. Janis, my spouse and cooking expert, and I reviewed several recipes and made some adjustments we thought might be an improvement. As mentioned, we started out with fresh, sweet, Bing cherries. As in the two previous test batches, I used turbinado sugar rather than refined white sugar. Turbinado has a bit of the raw molasses taste to its flavor and may not add much to the final product, but I like it and well, that’s what I wanted to use. Get over it. Part of the decision process was how to handle the fresh cherries. I bought a nice cherry pitter from Amazon and pitted all the cherries we used. Since we wanted to save the leftover cherry mash for other uses after we made the Cherry Bounce, I elected to keep the pitted cherries whole rather than chop or just split them. I leaned heavily toward a recipe that called for cooking, reasoning the flavors might be more intense. And since the rye whiskey gave a more complex flavor in my previous tests, I decided to stick with it as the alcohol base. Cherries pitted in my brand new, fancy-dancy, semi-automatic, cherry pitter, I cooked them down over a low heat with the turbinado sugar and some lemon juice. (The cooked mash tastes absolutely divine!) 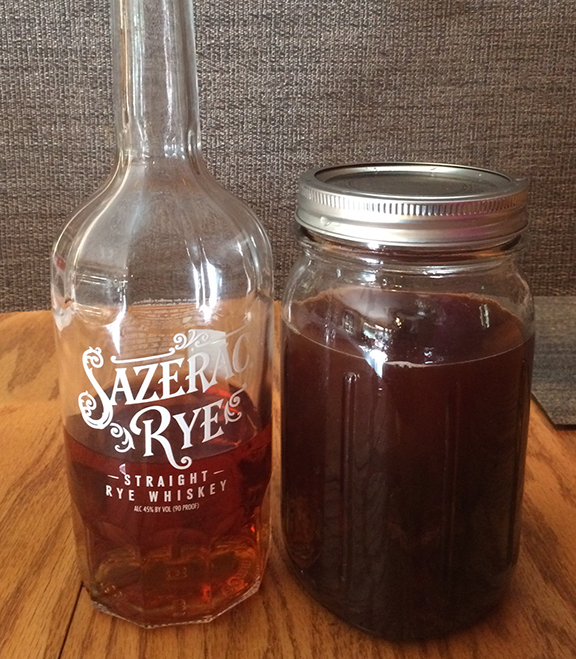 The Sazerac Rye Whiskey was added to the cooled mash. That has been put away to age. I will publish the exact recipe once I have determined I have it refined to my satisfaction. Meanwhile, I plan to run another series of tests, using the cherry mash from the original rye test batch and some from this new batch. These tests will be for a new cocktail I have tentatively named “MB’s Cherry Bounce Cocktail.” He loved Old Fashioned Cocktails, and my recipe will be based on an Old Fashioned. More on that once I begin that test, which will probably be today as I celebrate July 4th. 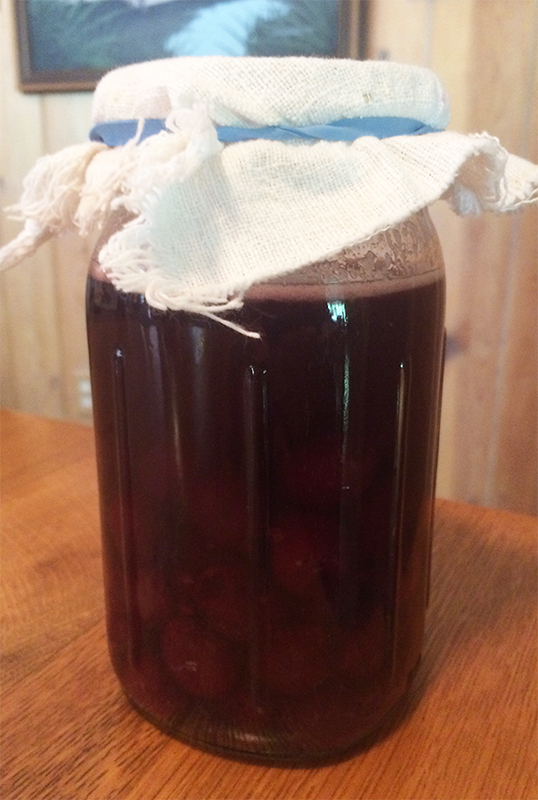 I wrote of my Cherry Bounce experiment where I am attempting to reproduce my father’s recipe here. Not having his original recipe, I used a modified version of a recipe attributed to Martha Washington. What I did not mention in that post is I later added a second experiment using an old recipe from a friend’s French mother, although slightly modified to accommodate my available supplies. I will call that one my Roy Recipe in honor of Mrs. Roy. She used wild cherries from her own yard. Not having a cherry tree in my backyard, I used dried, tart, pie cherries. Her recipe called for vodka instead of whiskey or brandy and not cooking the mash. So I have two jars set aside to rest for three months. Well, I couldn’t wait any longer. I know, it has been slightly less than two weeks, but I had to taste them. I could drink them now, and probably will next week for Christmas. The Martha Washington recipe with the cooked mash and Sazerac Rye whiskey is rich in flavors and complex, much of which comes from the rye whiskey. 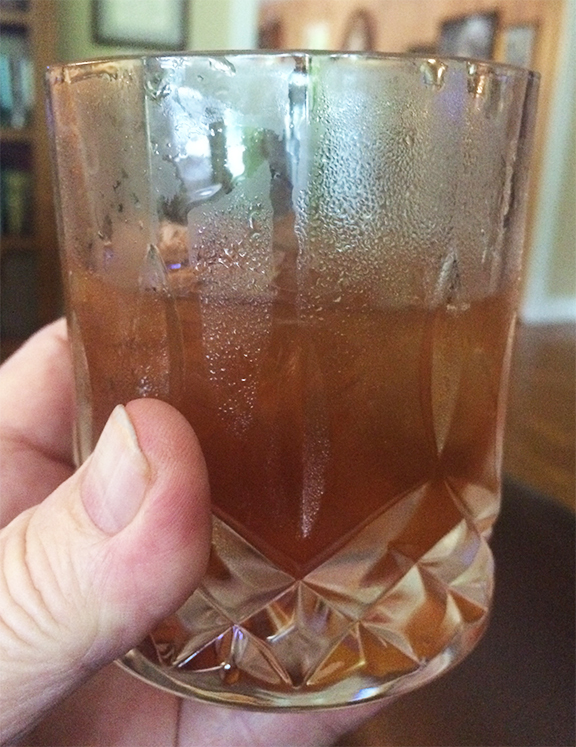 The Roy Recipe is less complex due to the vodka but is still quite good. Without the MW version to compare to, you would like it a lot. But I think I much prefer the more complex Martha Washington version. I’m pretty sure that one or a version of it will be the basis of my next and larger batch I’ll make after Christmas. I will allow others to taste both at Christmas and let you know what comes out of that. My dad, Dr. MB Casteix, used to make cherry bounce. His foray into creating adult beverages began when he was quite young. Since he started college two years earlier than most, having skipped two grades, he must have been younger than 16 on his first attempt because he was still living at home with his parents. At that time they were living on Bourbon Street in the building that is now the Famous Door Bar. It was a pharmacy at then, and the family lived above it. I wrote about his cherry bounce escapades here. I decided I would like to attempt to recreate MB’s cherry bounce, but I don’t have his recipe and have no idea how he made it. I did a search online and found a few recipes, including one that is attributed to Martha Washington. I did know one thing about MB’s recipe, and that was that it evidently continued to ferment in the bottle. In that linked post above, there was a recalled incident of the top blowing off the bottle and scaring the hell out of our maid. The recipes I found called for adding bourbon, rye, or brandy to the cooked cherry mash then storing that for three months. The alcohol should prevent any further fermenting, I would think. But I have to go with what I have. So…I created a modified version of Martha’s recipe in smaller test proportions and cooked up a batch. The attached pic is the cherry mash before adding the rye whiskey. Unfortunately, we will have to wait three months to see if it is any good.